Background: Uterine fibroid embolization (UFE) is as an effective alternative to hysterectomy and myomectomy. 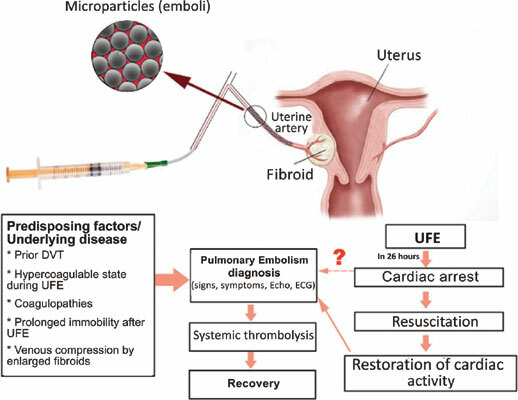 However, UFE is associated with a wide spectrum of complications including in rare instances thromboembolic events and even pulmonary embolism (PE). Case Presentation: A case of a 36-year-old woman suffering from a symptomatic uterine fibroid is described as follows. The patient underwent UFE and overnight she suddenly collapsed with signs of massive PE. In consequence of cardiopulmonary resuscitation and urgent systemic thrombolytic therapy, cardiac activity was restored successfully. Discussion & Conclusion: This constitutes another report of PE developed following UFE. In the case described here PE occurred 26 hours after the procedure was performed. Before UFE all patients should undergo complete examination for exclusion of pre-existing venous deep thrombosis and coagulopathies. Uterine fibroid embolization, hysterectomy, uterine fibroid, complications, venous thromboembolism, pulmonary embolism.